As quite as a mouse, yet not easily intimidated. High flow rates and pressures can also be achieved with Van Heck’s electrically powered pump units. Often used in civil and hydraulic engineering and in industry. The pump units are quiet, low maintenance and user friendly. All electrically powered pump units run on a three phase, 400 V, 50-60 Hz supply. The advanced PLC controlled frequency converters are ideal for this. The electrically powered pump units provide a practical solution because they do not require a dry location. Spud poles and base plates are used to position them at the required height, even on an uneven submerged surface. The pump units can be placed before the pumping station intake to take over its function. is available in 160 or 200 kW models. has a discharge head up to around 26 mwc. 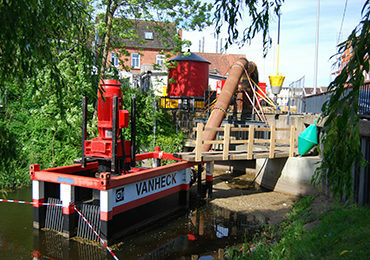 The pump units are self-priming, thanks to the combination of the vacuum system and non-return valve developed by Van Heck. has a discharge head up to around 18 mwc. attain flow rates of up to 1,700 m3 per hour.